John Dos Passos’s historical novels The 42nd Parallel, 1919, and The Big Money were published together as the U.S.A. trilogy throughout the 1930s. Soaring in ambition, lengthy in execution, and experimental in style, U.S.A. chronicles the early decades of the 20th century—before, during, and after the First World War. Each novel is constructed in four narrative modes. The first, and most familiar, is a series of fictional narratives following twelve characters as they make their way up the ladder of American society. The second, called the “Newsreel,” is a collection of headlines, article excerpts, advertisements, and song lyrics curated from major newspapers of the era. The third, known as the “Camera Eye,” is a stream-of-consciousness autobiography describing Dos Passos’s own life story. The fourth is an assortment of biographies recounting the lives of public figures from the period. In other words, U.S.A. reads like a history book gone mad. It’s not exactly fiction, and it’s not exactly non-fiction, and it definitely stretches the definition of “novel.” It is equally concerned with real events and unreal characters. I may not be the target audience for this Frankenstein patchwork of a text, but I can think of a few people who are—and I don’t just mean the author’s contemporaries, who showered it with improbable acclaim. the hopelessly obsolete slang terms, from “hunky dory” (good, fine) to “lettuce” and “kale” (both synonyms for money). U.S.A. is original, but not especially well-crafted… so let’s call it one of the goodest books of all time and leave it at that. Ned never said anything unless the talk came around to drinking or sailingships; whenever politics or the war or anything like that came up he had a way of closing his eyes and throwing back his head and saying Blahblahblahblah. If they thought the war was lousy wait till they see the peace. First things first: I loved this book. Loved it. This is the kind of book that makes the worst of The List worth fumbling through, and puts better-known authors to shame. This is the kind of book that sticks with you years later—that carries a great first impression into a long-term admiration. This is the kind of book you give enthusiastically as a gift, but only to readers you respect. This is the kind of book that makes you jealous of the author. Go Tell It on the Mountain (1953) follows three generations of an African American family from the Reconstruction era in the South to the streets of 1930s Harlem. 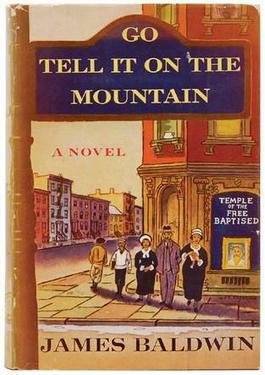 Relying heavily on Biblical themes, allusions, terminology, and rhythm of the King James variety, many critics have noted that the novel reads like a sermon. Tackling heavyweight themes doesn’t always make for a Great book, but it doesn’t do this one any harm. The chief protagonist, 14-year-old John Grimes, struggles with family conflicts, a religious crisis, and his own coming-of-age, along with more peripheral issues like racism and sexuality. Go Tell It on the Mountain is, in fact, semi-autobiographical: After a religious awakening at the age of 14, Baldwin himself became a minister, preaching for three years at a Pentecostal church in Washington Heights. Do yourself a favor and read this book. In a world of native advertising, Twitter, and emojis-as-wit, it might be time to remind ourselves what quality writing looks like. Men spoke of how the heart broke up, but never spoke of how the soul hung speechless in the pause, the void, the terror between the living and the dead; how, all garments rent and cast aside, the naked soul passed over the very mouth of Hell. With the birth of Gabriel, which occurred when she was five, her future was swallowed up. There was only one future in that house, and it was Gabriel’s—to which, since Gabriel was a manchild, all else must be sacrificed. Her mother did not, indeed, think of it as sacrifice, but as logic: Florence was a girl, and would by and by be married, and have children of her own, and all the duties of a woman; and this being so, her life in the cabin was the best possible preparation for her future life. But Gabriel was a man; he would go out one day into the world to do a man’s work, and he needed, therefore, meat, when there was any in the house, and clothes, whenever clothes could be bought, and the strong indulgence of his womenfolk, so that he would know how to be with women when he had a wife. And he needed the education that Florence desired far more than he, and that she might have got if he had not been born. Slow tears rose to her eyes; of joy, for what she had come to; of anguish, for the road that had brought her here. 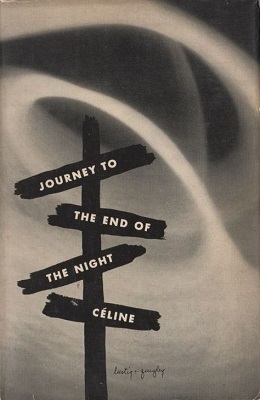 Like James Baldwin, Louis-Ferdinand Céline’s first book would become his most celebrated—and, like Go Tell It on the Mountain, Journey to the End of the Night (1932) is semi-autobiographical. But this time we accompany antihero Ferdinand Bardamu from the trenches of World War I to the streets of colonial Africa. From there, he leads us to the Ford factory in Detroit and then homeward to France. Bardamu, disillusioned to the point of cynicism by his experiences as a soldier, is highly critical of the “slaughterhouse” of war, declaring cowardice to be the only safeguard against its lunacy. My own flashbacks to Catch-22 proved relevant: Céline was, apparently, a substantial influence on Joseph Heller. But Céline’s influence was broader than that by far. French literature had never seen anything quite like Journey—full of slang, obscenities, and vernacular, with an emphasis on the rhythm of spoken language. The book’s release was met with controversy, and Céline narrowly missed out on the Prix Goncourt in a contentious vote. The end of this anti-nationalist, anti-colonialist, anti-capitalist novel sees Bardamu working as a medical doctor in a poor suburb of Paris, calling war and illness “two infinities of nightmare.” It is precisely this beautiful, blunt language that makes Journey to the End of the Night so compelling—and precisely the kind of melancholy that makes it a tough read. I’m going to reserve my judgment until next time. This is going back on my TBR. That was the only time France ever saved my life, otherwise the opposite has been closer to the truth. After all, why wouldn’t there be an art of ugliness as well as beauty? Certain words are hidden in with the rest, like stones. They’re not very noticeable, but before long they make all the life that’s in us tremble, every bit of it in its weakness and its strength. You can lose your way groping among the shadows of the past. One of only a handful of classics focused entirely on animals, Charlotte’s Web is a masterpiece of children’s literature that resonates long into adulthood. Simple in style but warm in tone, E. B. White’s barnyard tale is a testament to the power of friendship, with no trace of sentimentality. Wilbur the pig is the runt of the litter, but his life is saved by a farmer’s daughter named Fern. When Wilbur is sold to Fern’s uncle, he receives a chilly welcome from the other barnyard animals—except Charlotte the spider. Wilbur soon discovers that his days are numbered, and Charlotte devises a plan to save his life: Using magazine scraps as a guide, Charlotte weaves words of praise for Wilbur into her web, attracting attention from neighboring farmers and then regional publicity. As his fame grows, so do his chances of survival. At the county fair, Charlotte spins an egg sac and warns Wilbur that her own life is nearly at an end. Wilbur heroically retrieves her unborn children and carries them back to the barn. Charlotte dies, and Wilbur is devastated when her babies abandon him, too—until he sees that the three smallest spiders stayed behind. In case you haven’t read it, and in case this isn’t clear above, THIS BOOK WILL KARATE CHOP YOUR HEART INTO PIECES. It was one of the first children’s books to address death and grieving, and we’re clearly not prepared even now for its wistful poignancy. My final word on this understated treasure of a book: Charlotte the spider is a feminist icon, and I don’t care who says otherwise. All the pathetic whiners who struggle to write female characters with agency can find a quick lesson right here. Charlotte is a brilliant, loyal, and tenderhearted badass who saves her friend’s life and never even asks for gratitude—all while pregnant. She’s an American hero. And if all spiders were a little more like her, I would not hide from them in a disgusted panic. If Wilbur is SOME PIG, this is undoubtedly SOME BOOK. Children almost always hang onto things tighter than their parents think they will. Life in the barn was very good—night and day, winter and summer, spring and fall, dull days and bright days. It was the best place to be, thought Wilbur, this warm delicious cellar, with the garrulous geese, the changing seasons, the heat of the sun, the passage of swallows, the nearness of rats, the sameness of sheep, the love of spiders, the smell of manure, and the glory of everything. A Clockwork Orange (1962) has the rare honor of being a source of shame and regret for its author, overtly and publicly. Nine years after its publication, a film adaptation led by Stanley Kubrick distorted, in Burgess’s view, the book’s most fundamental message—glorifying violence rather than condemning it. 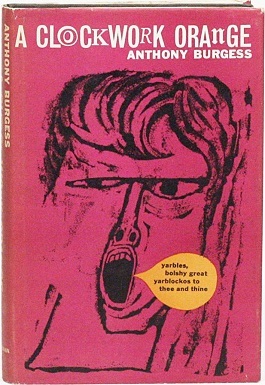 This, combined with his American publisher’s exclusion of the novel’s final chapter—in which the protagonist comes to view violence as “juvenile and boring”—left far too much room for misinterpretation, and Burgess spent much of his later career distancing himself from his most celebrated work. he said in his introduction to the 1986 edition. Still, however much I sympathize with Burgess’s disappointment over the book’s misguided public perception, I’m very glad A Clockwork Orange exists. Don’t get me wrong: The violence in A Clockwork Orange is brutal. It’s sickening and horrifying and repulsive. And, were it handled any differently, by a less talented author, I would have hated this book loudly and often for the rest of my life. But Burgess paints his violence through a portrait, carefully and thoughtfully. The book’s protagonist, Alex, is a sociopath and gang leader in a dystopian future. Clever but cruel, Alex accompanies his friends on a series of random attacks before his arrest and conviction for murder. In prison, he is subjected to an experimental treatment called the Ludovico Technique that functions much like aversion therapy. Alex is temporarily “cured,” raising questions about free will and the evils of government. After a suicide attempt, he returns to his old ways… but in the final, long-omitted chapter, Alex matures enough to consider how his contributions to society might be constructive instead of destructive. The novel’s most fascinating element, at least for me, was Burgess’s use of fictional slang terms he called, collectively, “Nadsat.” A mixture of Russian loan words, Cockney rhyming slang, Biblical language, German influences, and more, Nadsat is integrated into the text exceptionally well. I listened to A Clockwork Orange on audiobook and would recommend the same to anyone particularly interested in the inventive linguistic features of the novel. And if you can’t/won’t do that, I’d still recommend reading it the traditional way. I’ve never seen these exact themes managed quite this well before. But a better reflection of this book’s distinct merit is, perhaps, that I fully expected to hate it, and ended up loving it. It’s tough to stomach, definitely, but well worth the effort. What does God want? Does God want goodness or the choice of goodness? Is a man who chooses the bad perhaps in some way better than a man who has the good imposed upon him? Tagged 100 Greatest Books of All Time, A Clockwork Orange, Anthony Burgess, Book reviews, Books, Charlotte's Web, Classics, E. B. White, Go Tell It on the Mountain, James Baldwin, Journey to the End of the Night, Louis-Ferdinand Celine, Quick Reviews, Quotes, Reading, U.S.A. I have still got to read USA so was interested in your take on it. I love Burgess, but Clockwork is a bit didactic. His Enderby novels on the other hand are superb and hilarious. Someone with a huge passion for history and journalism would probably enjoy USA. It didn’t hold my attention especially well. Glad to hear your recommendations re: Burgess! 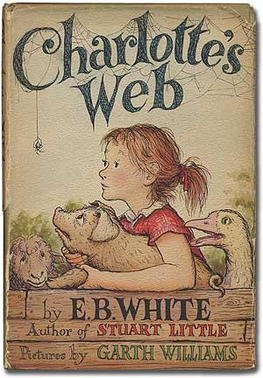 I read Charlotte’s Web as a kid and remember so little of it… I’d like to try that one again. As you know, books that kick my feels in are my kind of book. Since I trust your judgment, your opinion of A Clockwork Orange makes me more likely to try it. I’ve avoided it for a long time because I’ve had this (mistaken, I guess) impression that the book *reveled* in the gross and disturbing, and that readers who love it were loving it for that reason. But it sounds like I’m wrong, and I’m glad for that. WILL I try it? Still not sure, because I’m sensitive to stuff like that, but perhaps. Yeah, I will definitely be seeking out more Baldwin! Now I get what all the fuss is about. I can barely talk about Charlotte’s Web without tearing up. It’s so simple and so powerful. Definitely recommend. Clockwork definitely took me by surprise for that same reason. It IS violent, very much so, but the violence serves a purpose. I can’t stand gratuitous violence, but this didn’t feel like that at all, even at its most stomach-churning. It’s probably worth a try at some point. The audiobook read by Tom Hollander is fantastic.